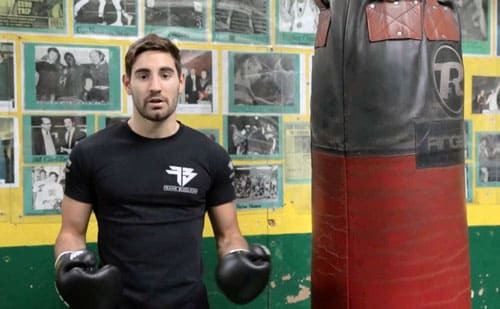 I was able to get UNDEFEATED professional super middleweight boxer Frank Buglioni to share some power punching tips for us here at ExpertBoxing. He’s currently 11-0 with 8 knockouts! And fighting again on February 15, 2014. This will the first part of a series where he shares some key tips to boxing training. I hope you guys enjoy and if you have any special questions for him, please let me know in the comments section! Make sure your hands are well supported with wraps for every training session. For added support, you can also use bandages, crepe, tape, gauze and any other padding. It’s always a good idea to avoid hand injury especially before a fight. For training, it depends where you’re at in your camp. Frank recommends using 14-16oz gloves for training and even up to 18oz gloves for sparring. The bigger gloves can give you added protection for your hands AND your opponent. You can also use smaller 8-10oz gloves for pad work and bag work if you want to work on your speed. Using the smaller gloves can also get you more accustomed to a realistic fight timing as smaller gloves are used in actual competition. How do you increase your punching power? Is power something god-given or something you can build and improve upon? Frank believes it’s a bit of both but definitely something you can improve upon. Technique makes a hell of a difference. As Frank explains, “Power is SPEED times FORCE.” So basically you can increase your strength or increase your speed. Now because boxing is a weight-making sport, boxers are will have to go for speed to increase punching power. If you were to go for size and strength, it would be harder to make weight and also give you endurance. There’s also timing and accuracy. The real damage is done when you’re hitting people in the right spots. So timing, accuracy, and increasing that speed are the keys to developing knockout punching power. 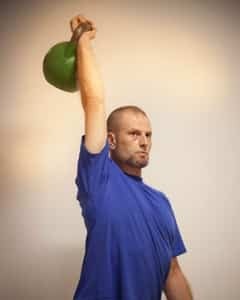 You should visualize realistic body positions on the heavy bag. Head punches should aim around the head height, with your arms aiming right to where you expect your opponent’s chin would be. For body shots, you want to aim at lower positions on the heavy bag where you expect your opponent’s body to be. It’s key not to stand at the bag hitting at the same spots. You have to mix it up as if it’s a human body. The secret is all in your hips. When you throw a right, the whole body rotates into the punch. You want to land, if possible, at the end of your reach. Turn your hands so the knuckle lands flush against your opponent. And that will limit damage to your hands. Line him up, turn the body, and let the punch come over. The same principles apply to the left hook. Turn your body and pivot on every shot. For punching power, you also need a nice firm stance. Your feet should be slightly wider than shoulder width apart. They can also be a little when you want to load up on your shots ( for more balance and strength). When you throw a right hand, the back foot pivots. With a left hook, the front foot pivots. This pivoting movement of the foot generates momentum in your hips for more punching power. Many people wonder about the unorthodox ways of training for punching power. For example: Rocky Marciano chopping down trees or Muhammad Ali punching under water. Frank feels there is definitely truth in those methods and that cross training and other methods can definitely help to increase punching power and rotational strength. 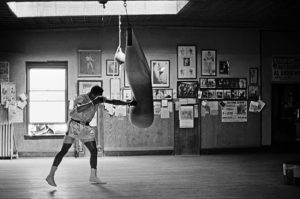 However, when it comes to boxing, if you want to increase punching power, you need to be on the bags and pads and practicing your punching technique. Punching is the training for punching. Johnny what you think about the old timers saying “Punchers are born, not made” Personally i don’t believe in it. I think there’s some truth in it. Genetics do play a big role in punching power. The way your body is made at birth has a great impact on your ability to generate power. Yes, you can improve your technique and strengthen your muscles but it’s not like you can take your bones apart and put them together again to give you more leverage. Some things are can be improved with training, some things cannot. Is it possible that a very weak guy can improve himself to become the most powerful puncher in the sport? It might be possible but statistically, it’s highly unlikely. With good technique, you should feel the burn more in your back than in your chest. If you want to burn off fat, you should fix your diet and do more total-body strength and conditioning exercises. I say you can become a stronger puncher if you have the right kind of training and condition yourself properly. They say out of the 150 amateur fights Tommy Hearns had he only knocked out about 12 or 15 opponents. When he turned pro though Emmanuel Steward worked his technique to perfection and then he became a ko machine. Yes some punchers are made but i do believe you can also develop punching power through hard work and proper technique. He probably did move up in power a bit but also one has to remember that knockouts are quite rare in the amateurs. I must agree with the old ones John. I have seen many people in martial arts trying very hard to excell. The only thing they managed was just an illusion they are good at this, but in real life (aka sparring) couldn’t do anything right. 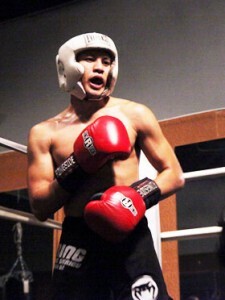 Even though I don’t have the experience of johny, I am sure that “boxers are born, not made”. The others just train, going from nothing to an ok level, but that’s about it. That’s insulting to all the champions and professionals who put in countless hours of hard work. and sparring is not real life not even close. Actually boxers are made not born, I have yet to meet a boxer who’s came out the womb and became undefeated or a professional and didn’t work for it. You wanna know why ,because every boxer spends countless hours improving so that the can compete and say they have beat the best. You have no idea what your talking about and just wanted to comment. What he said are the same things the coaches say to everyone all the time. Everyone new member learn all these things the first day they step into the gym and every time they hit the bag/mitts/shadow box the coaches would keep correcting them. I’m really surprised that these are “pro boxing tips for punching power” because they are the basic instructions everyone are supposed to follow when punching for the first time. Only after you have mastered these do you get some leeway from the coaches for some creativity on the heavy bag. If this article is all there is to punching power, then I would think that punching power is god-given because I can see difference in punching power AND technique despite everyone being taught the SAME THING since day one and beyond. So if punching power is technique, technique requires talent. I’m sure Johnny is one of the guys who can learn something for a few months and already find himself executing moves better than guys who have been doing it for over a year. That is probably talent as everyone receives the same instruction. There’s definitely more to punching power than what is explained here. I imagine Frank was trying to be brief instead of going into full detail. Perhaps I can get him to share a little more in future videos. Wood chopping would definitely build power but I don’t think punching underwater would have any significant effect in any aspect of boxing performance. Besides, Muhammad Ali could not punch through the surface tension of water for a HW. It was a good idea to invite a pro but the one message in this article that I see really is conveyed is that effective power is dependant on timing and accuracy and speed and distance and technique (i.e. delivery skills) and that the best way to build punching power is to practice powerful punching (what should be a no brainer but to far too many, is not). Agree, but wouldnt have noticed that was what he was saying if didnt read ur comment. The reason u thought his main point was that is v’because u already knew. Thats why if u say it like the coach or frank ppl will nvr get it. Great!, always put more and more quality in your site!! I agree with you, Daniel. Hopefully we can get something more in-depth in the future. As it turns out…many boxers are much better at doing than explaining. They do very many complicated things with their bodies but are only aware or are only able of explaining a few of them. I want to thank Frank for his time putting this together and to Johnny for providing consistently beneficial content. The reason it may appear so ‘basic’ to some is because it is just that a perfected example of basic techniques. Learn the basics, relax, work hard, repeat. There are no shortcuts or special moves that trump years of experience. Ability + Observation + Reaction = A fighting chance. “Special moves” are born from years of experience. No one is looking for a shortcut here (although shortcuts do exists for some things). Have you read Johnny’s 1-1-2 article? Years of basic techniques and instructions did not match up to the experience of one sparring session with a pro. Why? Because sparring with the pro was an experience. EXPERIENCE produced that article. Here is a pro with lots of experience and if he wanted to include his experience in the article there is no doubt it would turn into a very different article and you don’t want that? It’s like expertvillage youtube videos vs expertboxing articles. The quality is vastly different regardless of whether the content is “correct” or not. Remember, there may be no point is saying anything if this was a once only project, but this is “the first part of a series” which means that we need to speak our thoughts now if we want the latter part of the series to be more than just an expertvillage set of clear cut and dry set of instructions. We may change nothing, but it’s worth a try. Yea lol i was like yes! a pro on power punchin? Gotta read asap then its what u guys say basic stuff. Johnny wrote like 3 articles on punching form already? But thanks frank for sharing. I know hes giving his time, just pointing some things to make it better. This is good advice if u dont go to a gym, or have a bad trainer, or if u dont read johnnys other articles. U guys are being too nice, but sometimes being nice is not always good for both sides. Just say what u think without insulting anyone and its called constructive criticism which is good for both sides. Thanks and i look forward to the next. I’m completely in agreement with you. With that said, I’ve found there’s always more to the techniques than what Frank or any other pros explain. Yes, you have to turn the hips. But it’s HOW you turn the hips that matters. What muscles are you using? What visualization? How much or how little? So yes, do all the things he says but then go further in-depth about those movements. Those details right there are the key for me. And unfortunately, not many guys are able to explain this. um actually “Power is SPEED times FORCE.” So basically you can increase your strength or increase your speed” is false ,false ,false I absolutely hate it when laymen try to sound intelligent using pseudo-science although they may have the best intentions but this is how urban legends start and as you guys all know martial arts/ combat sports are full of urban legends so here we go. “The kinetic energy imparted to the target equals equals mass multiplied by velocity squared”. therefor double the mass you punch twice as hard, however double the speed you punch four times as hard. SPEED IS KING!!!! There are way too many variables in the human body and punch ability to define power by an equation like power =speed x force. I think speed and strength are always trumped by precision and technique. I get power from shoulder and hip rotation. Also a snapping punch may not feel more powerful than a pushing punch when you hit the bag but it makes a difference when you hit a person. A person can roll with a pushing punch but snappers unleash their energy instantly. Technique then Precision then speed then strength. Not quite, even if it was that simple that would be the end product between the end of the fist and the target. It says nothing about how that power is generated and how it is grounded. A better way to think of the “impact force”, the effective “power” would be to think of it in terms of the total pressure on impact, or total force depending on which you value as more valid for punch power, over time exposed to that momentary pressure. In a pushing type punch it may be that a greater force could be transferred in total but that force would likely consist of a lower peak moment of pressure and spread out over a longer period (a push) than a snapping, grounded type punch that lasts for a shorter “pop” but produces a much sharper spike of power. Id rather get hit with a 10 lb sledgehammer at a 100 fps than a 2 oz slug from a shotgun travelling at a 1000 fps. Why is the bullet more effective??? It disperses all of its energy instantaneously. The sledge hammer does not. It will knock you to the ground because your body would be pushed by it as you absorb the energy throughout your body. A 2 oz slug from my 12 gauge wont knock you down but it will put a hole in a deer the size of a softball sometimes larger. Boxing isn’t pushing its punching. Pushing punches waste energy and leave you open for a counter. Or at least that’s what my trainer Peter Manfredo Sr. says. this is directed to both christopher LaRose and Mark Tomkins, I may have been a bit simplistic in my post with regards to power in punching. I agree with you both as there are a lot of variables to consider. But what I see and hear a lot when it comes to developing power are mathematical and scientific formulas that are incorrect or even made up. some people read this and take it as gospel spread it and all of a sudden it becomes “fact”. I have no doubt that I would not like to be hit by frank and nor do I think that he that he doesn’t have the ability and knowledge to develop power it’s just that I am sick of pseudo-scientists. You can be as strong or as fast as you want but without proper technique you got nothing!!!!! PERIOD!!!!!! Frank has perfect technique and Im sure there are plenty of people out there who are stronger and faster but dont hit as hard him. He knows how to rotate his hips shoulder and feet to create something called “leverage” and “leverage” doesnt happen unless you know how to create with your legs shoulders and hips end of story. My trainer has never once told me to pick up a weight more than 5 pounds, But constantly is correcting my technique. I use speed only to get to the target with a relaxed arm and activate all the needed muscles as I land the punch at near full extension and draw it back just as fast and relaxed. SNAP!!!!!!! I dont mean to sound nasty about it but it aint “psuedo science” its reality proven to be fact by those who teach it. BTW this is the best debate forum in existence. Thanks for all the great articles Johnny! Keep it up. Theres not a single how to website in the world like this!!!!!!!! Absolutely true, Christopher. Pushing punches can be easily rolled or parried away. A skilled moving opponent is simply not going to be there for you to “push” at. Whatever damage you want to cause needs to be inflicted at the moment of impact. Loved his last comment which is so true. You want to increase your punching, punch. You want to increase your bench press, then bench press. That’s basically all it comes down to. Nice videos on youtube with frank, nice change of pace and different view point. I was just wondering, have you made any guides on mitt work? More specifically how to hold them? Not literally you know what I mean. For example, do you make combos up before hand or is it as simple as saying jab-cross-slip-left uppercut? Thanks for the site and keep it up! Hi Mitchell, I have a video on mittwork coming out on Youtube soon that goes over my approach regarding mittwork. There are many schools of thought. Some trainers will call out every single punch and evasive maneuver that they want, whereas other trainers will teach you automatic combinations. I recommend training with a combination of both as different drills will develop different skills. When it comes to working with beginners, you’ll probably have to start out calling out every punch. Once you build up some chemistry between the fighter and trainer you can then move on to the other stuff. Thanks for the advice Johnny. Looking forward to that video. Thank you Adri! I appreciate the comment. You look not like a guy who knows only boxing but more like a well rounded man.And maybe you can answer me to a question beside boxing.I like to train so much even if not compete, it’s a way of life for me but now I want to start a career and for six month I need to study hard but because I was never a hard working guy in study now I can focus and my memory seems to be lost.I’m only 20 so I know it’s not to late to start.Maybe I need baby steps first,lol.Some help please, if you can? Hi Ali, I won’t answer everything in one comment but I do have many guides on the website that can help you with all those issues. Please read through them and then comment on the related guide when you need. Good luck! Thanks for another great article. As an addition to the are heavy punchers born or trained, I was wondering what you thought about setting your training priorities. At 6’3″ and 175lbs I have range, fast footwork and movement on my side, but as I’ve mentioned elsewhere I have very little natural power or strength. I do however pick up technique very quickly. My question is whether in these circumstances someone like me should spend time working to try to become stronger or more powerful, or accept the situation and focus on becoming as technical, accurate and fast as possible? I am a recreational Thai boxer so I have limited time to commit to training and need to make sure my priorities are right! Punching power can be a result of natural born ability, learned, or a mix of both (most common). Sometimes it’s not even your punching power that’s the problem but perhaps the way what you stand. Your boxing stance can have a lot to do with how your ground and generate rotational power. It is never an option to “accept the situation”. You should always be looking to improve yourself in every way possible. You are right of course, we should never accept our weaknesses. I suppose what I am asking is whether I should take time to work on calisthenics or weight training, or focus on developing my speed and power by becoming more technical and spending all my training time on sport-specific work (pads/bag/shadow boxing/sparring etc). Technique and calisthenics are your best bet. Some weights are ok as long as you’re not over-doing it and making it a weightlifting workout. does natural flexibility in joints means no punching power? Practice a lot and you will become more confident. Face your fears head-on and you will become more confident. anybody whos a boxer should know that proper form is what allows you to utilze your punching power effecently but form dosent generate the power- your muscles do by contracting from being relaxed to generate the speed then you use your hip muscles and core muscles to snap your arm muscles a a high speed therefore creating the power right so then how does making your muscles more explosive not help increase your speed for more power during form? so dosen’t form transfer the power when you connect and your muscles generate it when you contract(twist your hips,snap your arm out)? Hey buddy, I was peeing down my shorts the first time I spared. Its OK to be scared. After three years I still get a little nervous before I spar. I like it. I want to know about the Exercise for abs (for steel Abs) and second thing pls guide me to how I can handle punch on my face and third thing Boxing is good for street fighting. Punching with dumbbell is good for speed. 1600m running and 50 sit-ups and 500 punches in air with both hand is good enough . Bench press is good exercise for the boxer. Ridiculous video title. If that guy ever trained in a boxing gym, he would know that many well-trained fighters do this already. It was probably more popular back in the day when fighters did a lot more calisthenics. And now famous (again) today with the MMA guys doing all kinds of re-invented old school exercises like “battle ropes” and what not. It’s a good exercise, intended to be implemented alongside the hundred other good exercises in your training routine. 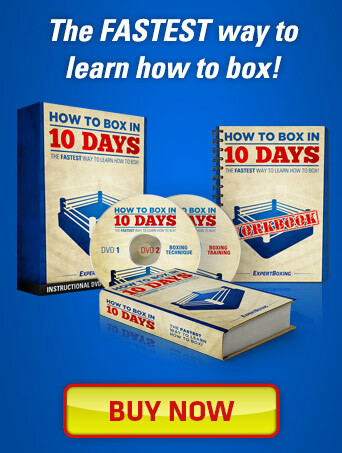 Read my body punching guide – The Art of Body Punching.